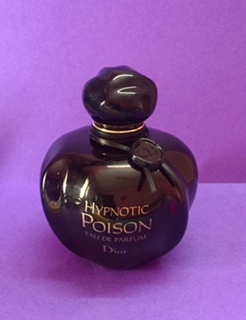 I shall be reviewing a fragrance that has been creating ripples for long and yet I had been avoiding it because the name Poison somehow suggested that this could be too strong a fragrance for my liking .But when a close friend strongly recommended it ,I thought of giving it a second thought . Price - Mine was a gift from a friend but I checked online and the Eau De Parfum is listed at Rs 9389/- plus delivery charges(on Amazon ).Though I am not sure how genuine these may be so it is better to get it from a reputed seller or from that NRI cousin ! Presentation - The rounded red glass bottle is definitely attention grabbing though I prefer sleek bottles . It is a spray bottle . Since this is an EDP (Eau de Parfum ) one spray is enough .I applied it on my wrist and it stayed put for at least 4 hours and even the next day I could smell it though faintly . Even though the perfume is strong but it does not overpower my senses like some perfumes do and end up giving a headache . It is described as an oriental vanilla fragrance for modern women .Bold, sweet, smoky, warm, voluptuous ; long lasting Top notes of almond and licorice Heart notes of sambac jasmine ; orange blossom Base notes of tonka bean and vanilla . I smell the sweet Vanilla ,Almond and orange blossom heavily and I think though suited more to a woman it can easily be carried off by young girls as well. The sillage is good .Sillage (pronounced as see-yazh) is a term used to describe a scented trail left by the fragrance wearer.I sprayed it on my wrist and you could still smell it from a distance. Good for evening wear and winters because of the warm and bold smell . It smells luxurious and not like a cheap fragrance . It reminds me of warm summery nights in a garden of fragrant tropical flowers . The price can be a deterrent but since the longevity and sillage is good , I think this one is worth every penny .I think mine will last me a year even if I wear it everyday . Some may find it a little strong but it does settle down within 10 mins of spraying . Somebody commented that it smelled like agarbatti (incense ) which to me is not really a con because Hey ! an incense stick still smells nice ! The only true con to me is that it does not seem to evolve much with wear.I like perfumes that show different layers .This is a big cloud of vanilla and flowers and stays so till the end only diminishing in strength with time but no changing the character . FINAL VERDICT - I rate it a 3.8/5 . I do not see myself getting bored of it soon but maybe I may find it a wee bit heavy for daily wear in summers unless used very lightly . Which is your favourite fragrance ? I really cant afford it, though i liked it from your review. Thank you Jyotirmay for reading my post and liking the review .I too feel guilty of extravagance but then it will last me for a long time . I own this one and I got it from Malaysia. This is one of my favourite perfumes till date! Why don't you suggest some more good ones since we have similar taste in fragrances !